Murray Lord at Wellington Yacht Partners tells me he's taken over the central sales listing on Palmer Johnson’s 34m sailing yacht Keewaydin with a $400,000 price cut. Delivered in 1996 and refitted in 2010, she’s the last sailing yacht to be built by the yard. The collaboration of Palmer Johnson, John G Alden and John Munford resulted in a superlative sailing vessel that could travel the world in unrivalled style and comfort for a vessel of her size. With Hood roller furling masts, Reckmann headstay furlers, a shallow draught centreboard design, a reliable Caterpillar main engine and a sail plan capable of powering her in all but the lightest winds, Keewaydin represents the epitome of a world cruiser. 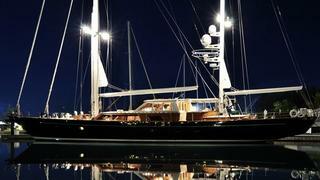 Lying at the Newport Shipyard in Rhode Island, Keewaydin is down to $3,950,000.